Meers, a full-service digital marketing and advertising agency, selected as Kansas City's Top Company for taking a unique approach to business, contributing to the community and demonstrating overall growth. 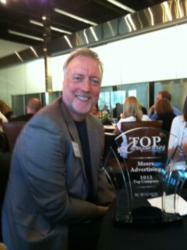 Sam Meers, Meers President/CEO accepted the Top Company award on behalf of the agency bearing his name. KC Business recently announced Meers Advertising has been selected as its Top Company of the Year for 2012 at a dinner/awards banquet held on July 26, 2012. The magazine had previously announced in its July issue that Meers was among the Top 10 Companies, winning the “Reinvention” award. As winner of the Top Company award, Sam Meers, Meers president and CEO, is featured in the August issue. Now in its sixth year, Top Company nominees included all companies—large, small, public or private. Judges looked for innovative, well-rounded and growing businesses to round out the Top 10, and ultimately to select the Top Company of the Year. In addition, the awards highlight companies taking a unique approach to business, while contributing to the community. In addition to being profiled in KC Business Magazine, as part of Meers winning the Top Company award, Sam Meers was interviewed on local Kansas City NPR affiliate KCUR (89.3FM) Radio on the Central Standard show on Tuesday, July 31. Meers shared his perspective about how the advertising industry faces just as many uncertainties as any other sector of the economy, with changing consumer attitudes and an increasingly fragmented media landscape, and how Meers reinvented itself in 2008 to embrace these changes. Some of the other Top 10 finalists included such companies/organizations as Kansas State University, Perceptive Software, DuraComm, Truman Medical Centers, Gail’s Harley-Davidson and NetStandard. Meers is a full-service digital marketing and advertising agency headquartered in Kansas City, Missouri. The agency works to advance their clients’ business by helping them solve marketing challenges through relevant, engaging and compelling communications. Meers is a member of the American Association of Advertising Agencies (4As). The agency was identified as the fastest growing Kansas City private company in 2011 by Inc. Magazine’s “Inc. 5000.” (http://www.meers.com). Based in Overland Park, Anthem Publishing Inc. (API) provides compelling content, advertising opportunities and recognition programs through publications such as KC Business, Good Health KC and KC Magazine. Anthem fills a need for sophisticated business and lifestyle coverage in the greater Kansas City community. People turn to KC Magazine, along with its sister publications, KC Business and Good Health KC, for news and in-depth stories that affect their lives. (http://www.anthempublishing.com).